In-depth analytics on US listed companies for smarter investing. …amongst a wide range of other data points and analytics. Note: Datasets vary from company to company, and are limited to every company’s information disclosures. …amongst a range of other datasets and analytics. Get ahead of the market with this geography screener. Select a country or a region and it’ll churn out a list of companies that have an exposure to that particular geography. This tracker helps in tracking which companies stand to benefit or suffer based on geopolitical developments. Screen companies based on Asset or Revenue exposure to over 30 different countries/regions. Dataset includes 500+ companies, updated annually. The company snapshot tracker has predefined charts which help in quickly determining how a company has been performing over the recent past. The tracker contains quarterly financial data for over 5,000 companies. It comes handy when we’re starting to research a new company, and we need to get a quick overview about how the concerned company has performed of late. Data updated bi-weekly. 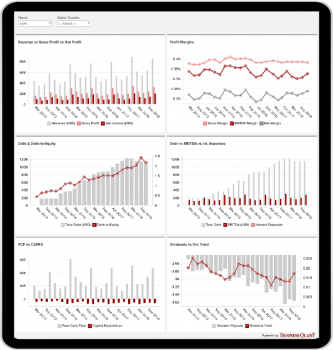 This tracker has quarterly financial data for 5,000+ companies, with over 55 different items — income statement and balance sheet items along with efficiency and valuation ratios — making investment research a breeze. I used to spend hours extracting financial data from SEC filings and then trying to make sense of it all, but I don't have to do that anymore thanks to BQ. I wanted urgent custom coverage on a particular stock for an open position and the folks over at BQ did that within a couple of hours. Hats off! I haven't seen this kind of exhaustive research in any B2C research platform before. Great job! Business Quant has made it very easy for us to ramp our investment research service. It's a bloomberg alternative, on a budget. Loving it! BQ's data helped me exit a few semiconductor stocks before the trade war drama unfolded. Huge loss avoided. Thank you! with us. We are happy to help!